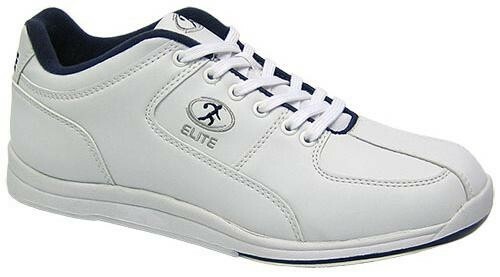 Check out these Elite Men's Atlas White/Blue bowling shoes designed with quality materials. These shoes have a universal slide sole with strong support to provide great performance for both right handed and left handed bowlers. Elite stands behind their shoes by offering a two year warranty! Wow! Elite Atlas Shoes are top performer! These shoes are so much better made than the alley shoes I used to rent for $3 each time so they will quickly pay for themselves and I love the stylish comfort no matter if you bowl 3 games or 20. Great value. Not the most stylish shoes on the planet, but I don't care about that. True to size, comfortable, functional, and appear to be well made. Great question Mo! These shoes have a universal slide sole with strong support to provide great performance for both right handed and left handed bowlers. Hello Ken! The Elite Mens Atlas White/Blue is a D width. Thanks for the question Steph! From the feedback we have received, this shoe seems to run true to size. Do these shoes come in a wide? Unfortunately we do not carry this model in wide width. The width is a D width. Due to the time it takes to produce the Elite Mens Atlas White/Blue ball it will ship in immediately. We cannot ship this ball outside the United States.